A chinchilla cage will need some basic necessities for a chinchilla's survival. Water Bottle - A chinchilla's water bottle does not need to be huge. A water bottle that you would use for a mouse will be appropriate especially as you will be changing the water daily. The most common type of chinchilla water bottle is one that has a ballpoint tube which prevents water from leaking - these are often referred to as 'gravity bottles'. Fresh water must be provided daily to help prevent dehydration and constipation together with build up of bad bacteria forming in the bottle's nozzle. Chinchillas generally drink between 15-30ml of water a day although this can increase in warmer climates and can vary per chin. Always provide at least 50-60ml of fresh water each day. Tap water is not advisable as it contains chemicals, which over item can be harmful to a chinchilla. The best and cheapest water to use is boiled tap water that has been left to cool. You can add some probiotics to the chinchilla's water system such as Avipro Plus. This will help keep the chinchilla's gut in good order and also contains some vitamins and minerals that a chinchilla needs on a regular basis. The chinchilla's water bottle must be hung on the outside of the chinchilla cage to prevent chewing and leakages. The bottle must be cleaned daily using a mild form of washing up liquid, making sure it's rinsed thoroughly - including the much forgotten, cap and nozzle. A bottle brush helps reach right down to the bottom of the bottle and helps eliminate the build up of harmful bacteria. Do not provide a chinchilla a bowl to drink from as the water will either get spilt when the chinchilla is charging around its cage or soiled with urine, faeces or food. Always keep a spare water bottle on hand as over time water bottles fail at the spout or drinking end causing water to leak from the bottle thus saturating the cage and making it difficult for a chinchilla to drink from. Food Bowl - The chinchilla's food bowl must be heavy enough for a chinchilla to sit on the rim whilst eating its pellets. Chinchillas generally sit on the rim of their food bowl whilst eating as sitting on the floor gives them a sense of unease. The food bowl will need to be secure or heavy enough to accommodate the chinchilla's weight and prevent it falling over dispelling all the pellets inside. There are various food bowls available, either one that clips on the outside of the cage and funnels food into a dish on the inside or a metal bowl that clips on the inside of the cage. Some chinchilla cages come with a small hole cut out of the frame for the food bowl to slot into. These type of chinchilla cages are practical when you need to clean or refill the food container as they avoid the unnecessary repetition of opening and closing the cage door. All food bowls must be cleaned daily with a small amount of washing detergent before rinsing thoroughly. Pellets will need to be replaced daily and only pellets made for chinchillas must be used. Pellets made for other animals such as guinea pigs and rabbits can have potentially harmful hormones added and in all cases, the ingredients are different to suit the relevant animal type. Hay Rack - A hay rack is not essential as chinchillas are happy to eat hay placed on shelves but without one, hay will be scattered everywhere and a chinchilla can either have an injury skidding on the hay when playing in the cage or can urinate on the hay making it inedible. 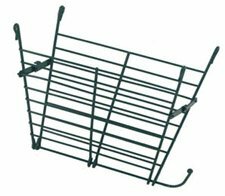 Hay racks are available in most pet shops and come in a difference of varieties. Most hay racks clip on the inside of the cage and some chinchilla cages come with a hayrack incorporated into the design. These cage types include a hayrack made out of galvanized mesh so the hay can poke through for easy consumption by the chinchilla thus keeping the hay contained in one area. Hay House - You can also purchase hay houses which can double up as a chinchilla house. These hay houses come in a variety of shapes and sizes and are made from long pieces of hay/straw entwined together around wires. If you decide to use a hay house, caution should be taken when the hay is getting low as sharp ends of the wire can become exposed causing injuries to a chinchilla. Hay Cubes - Hay cubes are another way of providing hay to a chinchilla. They are generally made from alfalfa hay, which is coarse and highly fibrous. A hay cube can double up as something to play with as a chinchilla throws the cube around the cage. 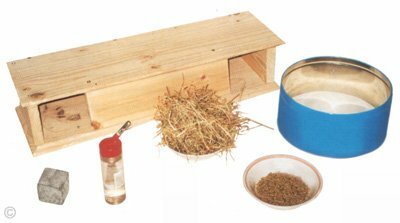 Hay cubes are also excellent if you or a chinchilla are sensitive to pollen and are a great addition to the chinchilla's cage whether you provide standard hay or not. Pumice Stone - volcanic rock that has formed from lava and water mixing together. Cuttlebone - a hard, brittle internal skeleton of the fish family Sepiidae (cuttlefish) - full of calcium! Hard Wooden Objects (see safe wood), not soft untreated pinewood, this will not file down a chinchilla's teeth. A good example is Cholla Wood - a form of dried cactus available from pet shops. House - All chinchillas will need a home within their cage for them to feel secure and be able to sleep peacefully. Anything placed inside a chinchilla cage will get eaten and gnawed on so you must ensure the type of house you choose for a chinchilla is safe. The healthiest type of chinchilla house is either a hay house (with a base for comfort) or an untreated pinewood house. You can purchase chinchilla houses from you local pet shops but these are generally made up of plywood, which can be extremely dangerous to a chinchilla. The wood splits and also contains a harmful sap/glue in between the layers, which can cause respiratory problems. A cardboard box is an excellent idea for a chinchilla home as long as it is strong enough for a chinchilla to jump on and not collapse underneath. 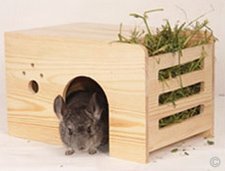 A cardboard house will quickly be demolished by a chinchilla but can be cheaply replaced and will act as an item of interest, which they can move around their cage as and when the chinchilla wants. Many owners position the chinchilla's house high in the cage but caution should be taken with this as chinchillas fly around their cage and an unsecured house can easily fall off a shelf causing severe injury or worse death. If you choose to place a house on top of a shelf, firstly make sure the shelf is strong enough to accommodate the weight of the house and also secure the house to the shelf itself. 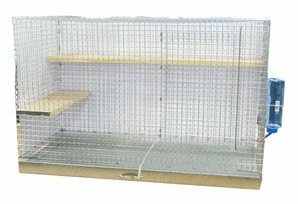 Shelving - All chinchilla cages must have shelving for a chinchilla to jump onto and also rest upon. This is especially important if you choose to buy a wire based chinchilla cage as constant sitting on the wired floor will cause Bumblefoot making a chinchilla's foot seriously painful and sore. All shelving must be made from untreated pinewood and securely fitted to the frame of the cage so it can not move or fall down. Shelving should also be close enough to each other so a chinchilla can jump freely between them. Something Soft to Rest On - Chinchillas need something soft to relieve the pressure of constantly standing on wired floors or hard shelving. You must remember that chinchillas will chew anything so the material must be safe and not cause harm. A soft towel folded up, is a great source as although it will get chewed, it can also be washed regularly. Sheet Over Cage - Covering a chinchilla's cage will provide privacy and seclusion from prying eyes that reassures a chinchilla their cage environment is protected and secure during their sleeping hours. As animals of prey, a chinchilla will feel vulnerable if overly exposed and trapped and begin to show signs of stress such as Fur Chewing or disturbed sleep patterns. Keep a small peek hole available at the quietest end of the cage, so if a chinchilla wants to check out what's gong on outside or is ready for interaction, they can approach the opening and show you they are there waiting. As a rule of thumb, never put toys or accessories on the shelving of the chinchilla cage. If any heavy object is knocked off of the shelf it can cause severe injury or even death especially to a chinchilla that may be underneath. Chinchilla Cage, Chinchilla Cage Maintenance.